Sometimes SharePoint Designer acts weird and does not show all the components. Some common issues include 'item cannot be displayed', 'site is disabled to be edited', 'unable to check in File', 'unable to see workflows' etc. The common reason for these issues are due to caching in SharePoint Designer. To fix this, you need to clear the cache and start again. Go to File Explorer and paste %USERPROFILE%\AppData\Local\Microsoft\WebsiteCache and delete all files. Go to %USERPROFILE%\AppData\Roaming\Microsoft\SharePoint Designer\ProxyAssemblyCache and delete all files. Go to %USERPROFILE%\AppData\Roaming\Microsoft\Web Server Extensions\Cache and delete all files. Open SharePoint Designer and you can see that all the data is cleared. Open SharePoint Designer 2010/2013 and navigate to "File" ⇛ select "Options" ⇛ "General" ⇛ "Application Options". 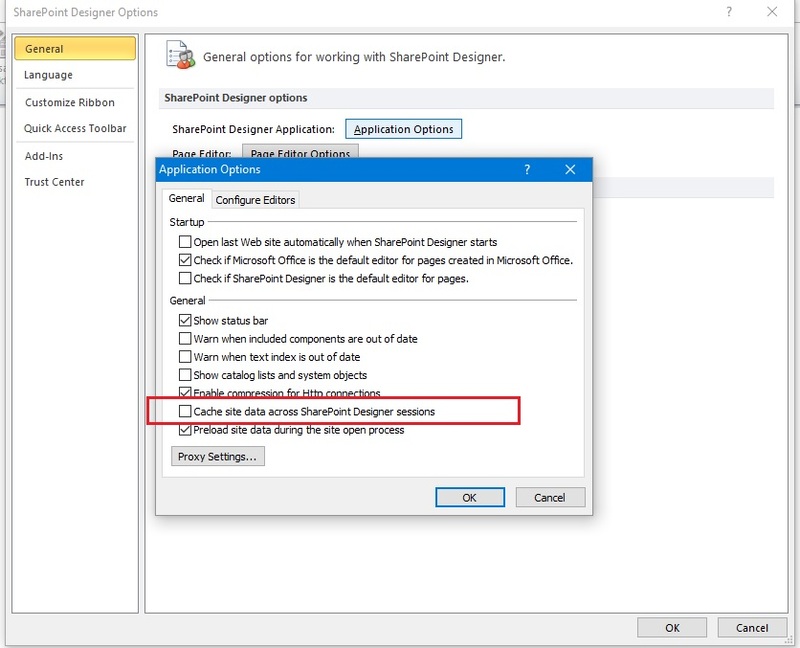 Now uncheck “Cache site data across SharePoint Designer sessions” and save.